With numerous glaciated summits over 11,000 feet, the Columbia Icefields is the perfect venue to learn the skills to climb alpine ice faces and push your ability to the next level.This advanced ice climbing training course will focus on the technical side of alpine ice climbing including steeper climbing techniques, snow and ice anchors, leading multi pitch routes as well as understanding and assessing mountain hazards. The ice faces on the Columbia Icefields area are world famous alpine objectives. 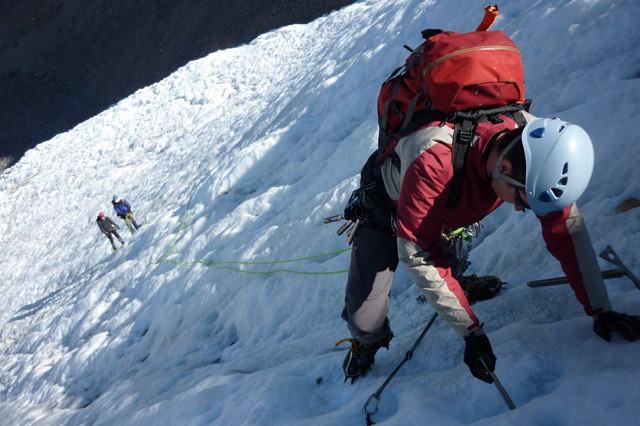 The North Face and Silverhorn of Mt Athabasca and various routes on Mt Andromeda are well known technical ice climbing objectives that bring climbers from all over the world. Participants will be given the opportunity to do some leads while learning the technical components of alpine anchor building, lead belaying, and route finding. Whether you plan to lead climb or follow on alpine snow and ice routes this ice climbing training program will introduce you to the required skills to climb more advanced ice-covered routes and peaks. 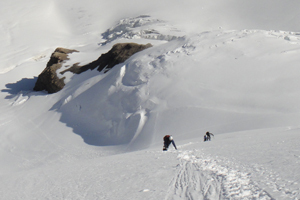 The objective of the course is to introduce you to the skills needed to climb steeper snow and ice routes than those encountered on beginner level courses. Many of the Rockies’ best alpine snow and ice routes are found in this area and, whenever possible they will be incorporated into the course. Many of the harder climbs in this area are quite long and can take up to 14 hours return; elevation gain is typically around 1450m or 4,800ft. We have found that the best approach is to alternate the longer climbing days with shorter instructional days or shorter climbs. 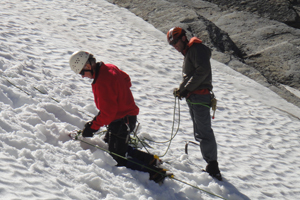 On instructional days we primarily cover topics specific to alpine snow and ice climbing. If time permits we may be able to review general mountaineering topics with you. Teaching on the ‘instructional’ days will be based on explanation and demonstration of techniques followed by ample opportunity to practice. These techniques will then be used on climbing days. The guide will lead a climb, demonstrating the appropriate techniques and imparting his or her knowledge to you. This includes not only alpine climbing systems but also the mental approach, drive, and judgment that fuel the successful mountaineer. To give the best mountain experience and to enhance safety, instructor to participant ratios on climbing days do not exceed 1:2. Training days are at a ratio of 1:6. Day 1: Meet at 9:00am at the Columbia Icefields campground cook shelter. We will issue and check equipment before heading out for advanced instruction on crampon, technical ice axe use and ice anchors. 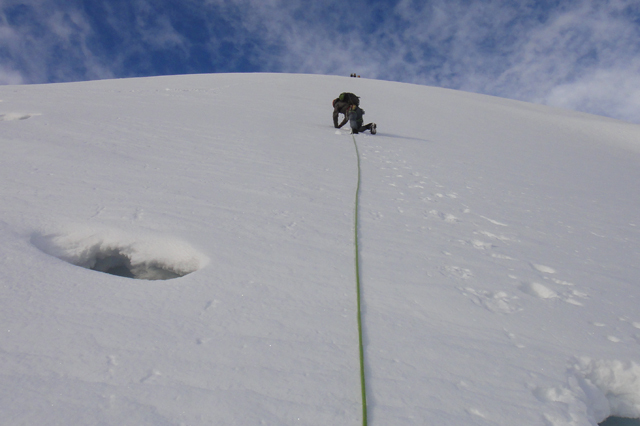 We will also review and build on intermediate level crevasse rescue skills. This is typically done on the Athabasca glacier or the lower glacial slopes of Mt Athabasca. Day 2: After discussing and completing a daily hazard evaluation we will walk to our instruction site. Today we will cover snow climbing techniques, snow anchors, belaying and the multi pitch system. Our normal venue is under the East face of Mt Athabasca and its satellite peak A2. Day 3: We will put all of our skills to use on a long and classic alpine route. This is a guide led day. Objectives completed on previous intro to Alpine Ice courses have been Mt Athabasca 3491m (11,454 ft.) by the Silverhorn route, the North Face, the North Face/NE Ridge routes and Mt Andromeda 3500m (11,483 ft.) by the North Bowl or Skyladder routes. Expect to be on the mountain for up to 14 hours with over 1400m of elevation gain. Day 4: On our final day we will transfer our newly learned multi pitch skills to steeper glacier ice where ice protection, V-threads and belays will be used. Racking of equipment, movement skills, route selection and technical descent systems will also be covered. 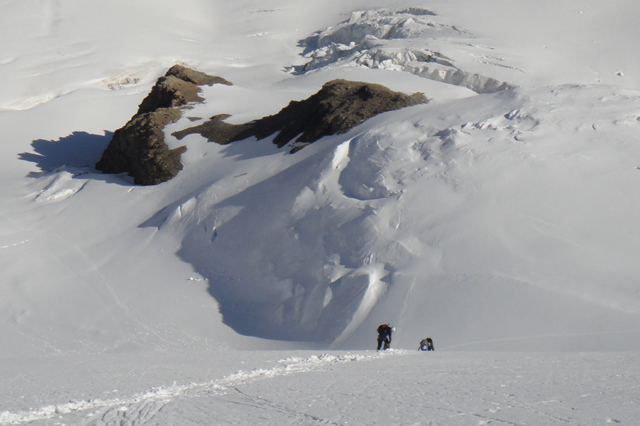 Student leads with direct supervision from your guide will transfer your new skills to steep alpine ice. The course wraps up after the climbing day has been completed. There is considerable flexibility built into the delivery of this program. Snow and weather conditions will dictate the order of presentation to a greater or lesser degree. 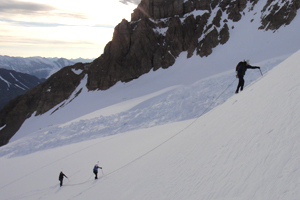 It is planned that three of the course days will be climbing days where techniques learned will be used during the ascent of actual snow and ice routes. 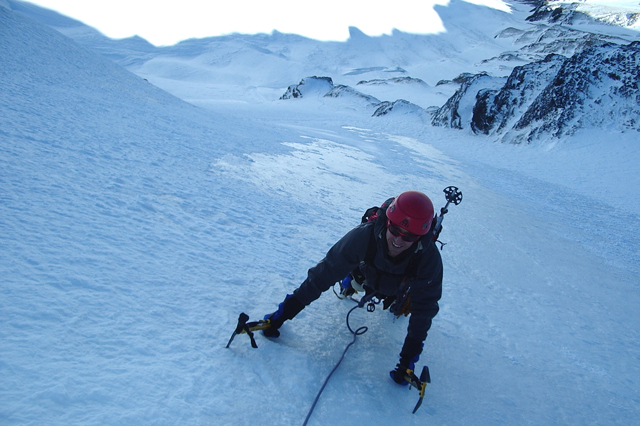 Commonly climbed routes include the ‘ice apron’ on A2, Athabasca by ‘Standard’, ‘Silverhorn’, and North Face routes. Other routes climbed less frequently include Andromeda by the ‘Skyladder’. It must be emphasized that participants will not be taken on climbs for which the instructors do not consider them ready or where conditions present undue hazard. The course meets at the Columbia Icefields Campground by the cooking shelters at 9:00am on Day One. Please be ready to go and have your gear handy so the instructors can check it with you. The campground is located 1km north of the “Wilcox Creek” Campground, and 1km before the Icefields Centre (Hotel, Info Centre, etc). The course is based at the Columbia Icefields on the border of Banff and Jasper National Parks, 205 km northwest of Canmore. It is ideal as glaciers, snowfields and peaks are right next to the ‘Icefields Parkway’, the scenic road linking Banff and Jasper. This allows us to stay at local roadside campgrounds, hostels or hotels. The Columbia Icefields Campground is the preferred accommodation option as it allows for better communication amongst the group. There is no cell service in the area. On occasion the final couple of days may be spent attempting some of the north face routes near Lake Louise. Camping (preferred): There are two campgrounds in the area. Most climbers use the “Columbia Icefields Campground”, which is a first come, first serve system. In peak summer, it can be hard to find a place if you arrive late in the day. It will cost around $16/day/tent site. The other campground nearby is “Wilcox Creek” for RVs. Glacier View Inn: If interested in more upscale living conditions then try this hotel. To book call 1 877 442-2623. If staying at the hotel you will need to bring your own breakfast supplies for the ascent days as the hotel restaurant will not be open early enough in the morning. Hostels: There are a couple of rustic hostels operated by Hostelling International within a 45 minute drive of the Icefields. Beauty Creek Hostel is quite a bit closer than Rampart Creek Hostel. They will cost you around $30/night. You can make reservations by calling 1 866 762 4122. Like any alpine region, this area is subject to extreme weather conditions. On days where high climbs are not possible we will arrange instruction sessions. Guide to student ratio will not exceed 1:6 on the first 3 instructional days. As you will be working in rope teams of 2 this will give the guide lots of time to focus on personal as well as group instruction. There will be a maximum 1:2 ratio on the summit day. 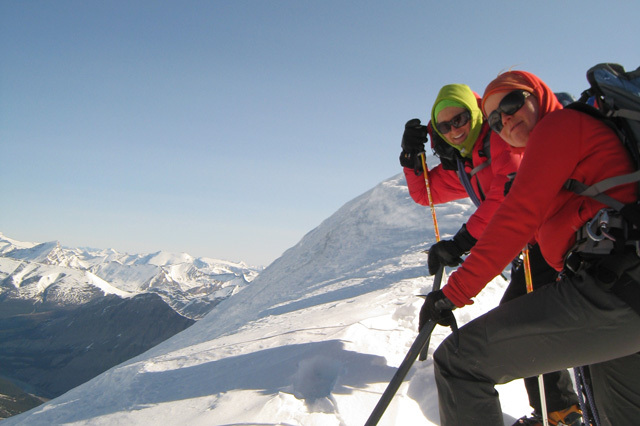 Our guides are certified by the internationally recognized Association of Canadian Mountain Guides or one of the other international member associations. They are also licensed to operate in the area by Parks Canada. The maximum group size is 12. The Icefields are located approximately 180 km north of Banff on highway 93 (“Icefields Parkway”). During the summer months the Icefields are serviced by daily bus from Banff and Jasper (Brewster’s, 403 762 6700, 1 866 606 6700). They also provide a service to Banff/Canmore/Lake Louise from downtown Calgary. It is necessary to drive a short distance each day between accommodations and climbing areas. Transport is not included. Park Entry Passes are not included in the program cost. For those flying here for the program we recommend flying to Calgary International and renting a car (major agencies). This will allow you to take your time getting to the Icefields so you can check out Canmore and Banff en-route as well as allowing you to check out the Icefields area (Jasper etc.) in the evenings. Meals are accommodation are not included. You will need to bring all food with you. Each day during the instruction and climbing you will require a lunch and snack food. Bring plenty of high-energy snacks. Particularly on cold days, we may not stop for long lunch breaks opting for more frequent short snack breaks instead. You will also need to bring plenty of liquids, especially on the peak days. There are several accommodation options available. 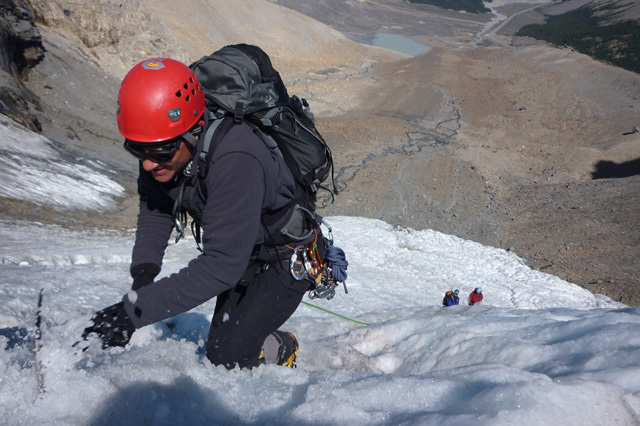 The instructors and most climbers stay at the “Icefields Campground”. Please see the information under the ‘Location’ information above for accommodation options. Boots: A good pair of mountaineering boots is essential. They need to be warm and crampon compatible. You are welcome to try the Scarpa Mont Blanc boots that Yamuska rents. Technical ice climbing tool: It is important to have a tool with a curved hand grip at the bottom. Yamnuska uses the Petzl Quark. Climbing harness: Should be sized to fit over your cold weather clothing. You will need to have a harness with a belay/rappel loop. Please book as early as practical to avoid disappointment. We require a 35% deposit including GST. Final payment is due eight weeks before the start of the program. This must accompany your deposit. If you would like the accommodation & food package please request when booking. Payment for this is due with the balance of course fees eight weeks before the start of the program. Please read the information on booking conditions and cancellation penalties carefully before booking. $1295 CDN includes instruction, guides, and use of technical climbing gear. Because we are based from the highway and several options are available, meals and accommodation are not included in this price. 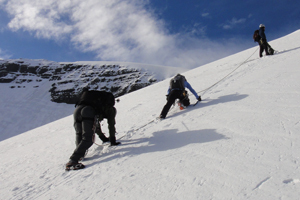 Participants need prior mountaineering experience. In the context of the Yamnuska program this would be a minimum of ‘Intro To Mountaineering‘ or a combination of ‘Snow and Ice Long Weekend‘ and ‘Basic‘, or ‘Ice Evolution‘. Participants must be in really good physical shape as this is a very demanding and arduous program. Climbs are long and you need stamina. We cannot guarantee to cater for those unable to handle this.